One round of internationals down one more to go, we are getting there. Less than a week left before we have premiership football back with our away game to Norwich. From Friday’s games the biggest talking point was the on-pitch assault of Theo Walcott against San Marino that has ruled the winger, striker forward out of England’s next game against Poland. We probably won’t see him in arsenal colours for at least a couple of weeks due to the injury, he has returned to arsenal for further treatment and so far no return date has been mentioned. Not ideal for the club though given our strength in numbers in midfield his absence won’t be felt as hard as in previous seasons. Away from the England camp a few reports surfaced over the weekend that our very own Andre Santos could be in line for a return to Fernebahce. Understandably this season his opportunities have been limited due to the form of Kieran Gibbs in the left back spot. Santos also wasn’t helped by the recent court case and charges for speeding on the way to training. The negative impact from that incident surely would have influenced Arsene’s decision making when picking the starting XI’s this season. Given the good start to the season winning teams don’t usually get shifted around for the sake of it, Santos just needs to bide his time and take his opportunities when they come. This logic doesn’t sit well with the gossip makers and the news of Fernabahce seemed an obvious assumption to make. Maybe there is a little truth in the rumour but our Brazilian no.11 took to twitter to express in his words the truth behind the talk. In his tweets he disregarded the rumours of any deal in the making with the Turkish club. Just my luck that he decided to tweet all this in Turkish so I pretty much had to rely on Google translate to understand what exactly he tweeted. And in true Google translate fashion the words read back like something Borat would say. The main gist of the tweet is enough to make out that he denies the rumours. He did go on to state that if any move were to happen in future it will be made with consideration of what’s best for his family. I think even Andre knows it would be silly to leave arsenal this season; there is no other competition for the left back spot beyond Gibbs. Knowing his injury record there will be plenty opportunities during a long season for the Brazilian to play. 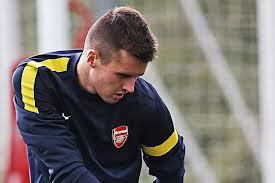 England have not given up the pointless pursuit of Carl Jenkinson to represent England. Given the fact that England use our facilities at London Colney to train when they play home games Roy Hodgson took the opportunity to invite Carl to train with the senior England players before they fly off for their game with Poland. I noted in a previous post that I didn’t agree with this sudden pursuit of Jenkinson. The only motive I can see from the sudden interest is to ensure he represents England rather than Finland. The pursuit is not to have Carl in the team now, there is no shortage in the right back department for England and if Carl was to make the decision to play for England he will just end up on a long waiting list. Carl definitely deserves the plaudits for his performances this season but talk of England is very premature in my opinion. There is no way he would be selected ahead of what England has and there is no guarantee he will even be first choice right back for arsenal once Sagna is back to full fitness. The experience of training with the England guys will do no harm in boosting his current sky high confidence so I have no problem with that. But please Roy don’t pick him for the next international friendly only for him to become a bit part squad player unless you honestly believe he can bring more to the current set up than Johnson, Walker, Richards et al. Well the fixture list was revealed for the 2012/13 season, the wheels are in motion and we have our first reason to get excited about a new campaign. We really have been blessed this summer in terms of the European championships filling a massive void AND the added distraction of the London Olympics to come to further quell the football cravings. The release of the football league fixtures is the first sign of closure from the last season and an indicator that we have it all to come again. We now have something to discuss other than the countless transfer rumours that drag on and on. The rumours that flooded twitter and other social media networks were confirmed correct as Arsenal were scheduled to kick off the new season at the emirates against Sunderland. Shout out to RedAction for the scoop. It’s always nice to start off the season with a home game, a chance to put three points on the board and start the season as you mean to go on. The only problem is that from the next four following games we have away fixtures against Stoke, Liverpool and Manchester city. As hard a run as you could imagine and a real test of the mettle and resolve of the Arsenal. If we can come through that test with minimum damage it can bode well for the rest of the season. Each of those three away fixtures are potential banana skins in any season so to have them out of the way early can potentially be a good thing. We have the added bonus this season of no qualifiers for the champion’s league. That is something that really affected our start to the last season as transfers were dependant on qualification and the futures of Samir Nasri and Cesc Fabregas weren’t concluded. It was quite a mess and an embarrassment to the Arsenal that preparation to a season was so up in the air. This time around transfer business should be concluded nice and early, morale should be a lot better and no qualifiers will be in place to upset our momentum. So what of the other fixtures? The first north London derby takes place at the Emirates on the 17th November; our chance for redemption at Old Trafford takes place on the 3rd November. I’ve always been scared of November when it comes to Arsenal; in seasons past it is usually the month when things start to wobble a bit. Last season we managed to come through unscathed but maybe it was the football gods balancing things out after our wretched start. The Christmas holiday schedule doesn’t seem too bad with two home games leading up to the New Year. West Ham visits on Boxing Day while Newcastle visit 3 days later. The holidays conclude with a New Year’s Day trip to Southampton. The final run in seems to contain winnable games with the exception of a home game with Manchester united set for the end of April. Of course we can beat Manchester united at home but it won’t be one of the easier games. The final fixture of the season scares me, an away trip to Newcastle. If we find ourselves in the chase for any silverware or placing needing a result at the St James Park it will be very tough. There is no guarantee Newcastle will match the heights of last season but one thing that is certain is Alan Pardew will not let his team roll over for us. Ever since his touchline spat with Arsene Wenger when at West Ham a few years back a bad feeling still exists between the managers and Pardew always ensures he gives Arsenal as much trouble as possible. Theo Walcott was passed fit for England which is great news; I do however feel that Roy Hodgson will not start the Arsenal man against the Ukraine. Hodgson will go for the cautious approach but I will expect to see Walcott or Oxlade-chamberlain to make an appearance at some point in the game. If you are going to be neutral fans watching the game today drink some coffee and/or Red bull, it’s not going to be a pretty match. As witnessed in the past couple nights these final group fixtures have been tense affairs, everything is at stake and so the football will be nervy and downright energy sapping. I hope for all our sakes I am wrong and the game will be an open entertaining end to end spectacle, I’m clutching at straws now. Theo Walcott has caused concern in the England camp after limping off from training citing a tightness of the hamstring as the cause. For Theo to miss out in the next game would be a big blow after the impact he made in the last game against the Swedes. The biggest message you can send out to the manager when you are aggrieved at not starting games is to show him what you can do when you come on the pitch. Walcott’s goal and assist was the perfect response and a chance in the starting line up for the next game was not an impossible outcome. We all now know Roy Hodgson has carefully selected the best teams in his opinion that was best suited to play to his specific tactics. James Milner has left many scratching their heads at his worth to the team given his unspectacular performances. In his defence he has played to Roy’s expectation and is more unsung in the role he is asked to play. He has been a helpful assistance to Glen Johnson on the defensive side and can whip in a decent cross on the offensive side of England’s game. There are times when Milner’s robotic attention to detail is required and times when the more gifted, talented attacking players are needed. I think that maybe Milner would have been selected ahead of Theo for the Ukraine game anyway due to the fact England won’t be going into the game desperate for a win. They wont need to get at the Ukrainians from the start so I feel Hodgson will opt for a more cautious approach from the off. Rooney will probably start but in midfield personnel will probably be the same as was used for the Sweden game. It would still be a shame if Hodgson didn’t even have that dilemma to contemplate a switch but any impending injury will save him from criticism if England failed to qualify and he did not start the Arsenal forward. Theo did give us a scare during the Sweden game when he went down clutching his leg but that injury at the time was from his calf so today’s is unrelated. Theo has seemed to aggravate the hamstring which kept him out of the team during the tail end of the season; hopefully this has been spotted early enough to not keep him out any longer than Tuesday’s game. The news has filtered around that Arsenal’s first game of the season will be a home game against Sunderland. Source of this is from RedAction who may well be correct but since the fixtures will be released today 9am UK time I see no need to read into this too much. I’ll prefer to wait and see when they are out which will probably be by the time you read this post. I will be more interested in the games that occur around our jinx month November, The Christmas and New Year’s fixtures and the run in towards the end of the season. It was nice to hear quotes from M’Vila that he is aware of Arsenals interest and that he would be interested in a move to the emirates. “I like Arsenal and I like the premier league”. That’s the most positive quotes from all the players that have been linked to Arsenal since the season end so far. I now believe that transfer will happen once the Euros are over, not before though. Robin Van Persie’s Holland team bowed out of the Euros with a whimper last night. I think many Arsenal fans secretly wanted the dutch to leave the competition early so that the future of our skipper could be sorted out as soon as possible. 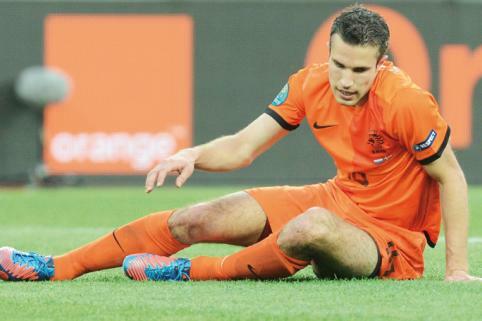 After Robin’s amazing season for Arsenal a lot was expected of the dutch master at Euro 2012. Even he must admit he hasn’t covered himself in glory at the tournament and his stock and ego has suffered a bit of a hit. Lets hope he can now decide whether he wants to stay at Arsenal quickly and look forward to atone for his disappointment as soon as possible. Update: RedAction were right. It has now been confirmed Sunderland home is the first game followed by two away trips to Stoke and Liverpool. Final game will be away to Newcastle. I will need time to digest to run the rule over the fixtures and will comment in a future post. Ladies and gentlemen he’s back on the national radar. The critics were left to eat their words last night as Theo Walcott’s introduction midway through the 2nd half changed the game in England’s favour. England were in dire need of inspiration from somewhere; they did well to fashion a one nil lead in the first half only to self implode with two poor goals conceded. One being an own goal from Glen Johnson and the second a free header for Olof Mellberg; England really went to sleep for ten minutes in the second half. England were in desperate need of a change to stem the flow as Sweden were growing more and more in confidence. I mentioned in my blog yesterday that I felt Roy would use Walcott’s pace in the second half to stretch the Sweden defence and keep them on their toes. What I didn’t expect was for Sweden to be leading at that time however what an impact that was made by Theo Walcott. Theo was brought on as an immediate reaction to the 2nd goal scored by Mellberg. The change was needed, something was needed to bring the game back in favour of England. Theo didn’t take long to make his mark, within 5 minutes of coming on he pounced on a loose ball cleared to the edge of the Swedish box from an Ashley Young corner, he cushioned the ball and pinged it through a crowded box. Luckily the keeper was unsighted and saw the ball too late to react, the ball flew into the back of the net and England was level. Walcott is not known for is long-range shots so this was a welcome surprise for all. England fans, especially gooners were jumping up and down and cheering the goal that given England a second chance to get a result. Arsenal fans have had to put up with the constant barracking of Walcott as people questioned his right to be in the England squad. Mark Lawrenson tended to put the knife in when Walcott came on the pitch when he suggested that Theo has apparently been living off of his hat trick performance against the Croatians 4/5 years ago. Pretty harsh but Mark Lawrenson doesn’t do positivity, I’m sure he must have Stewart Robson as a facebook friend. That goal was the perfect response to any critics and a reminder to Roy Hodsgon of exactly what he can bring to the England team. Theo wasn’t finished there though,England were level but the boost from the goal meant that their heads were up as they had a new impetus. And so then came the winner courtesy of some excellent work from Theo. From an England break Theo received the ball just outside the area from Glen Johnson; he turned at the defence and drove forward, he used his pace to get past two defenders to reach the by-line, he cut the ball back to Danny Wellbeck who with a brilliant piece of adjustment sneaked the ball into the goal with a back flick. Although it needed a good finish the pace of Theo unsettled the Swedish defence enough to create the chance, what an impact. The turnaround was complete,England had the lead and all they needed to do was hold on for the last ten minutes or so. 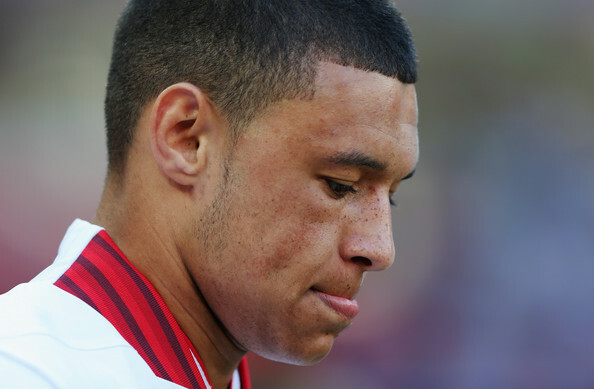 With a few minutes left Roy Hodgson made a change and brought Alex Oxlade-Chamberlain on. A bit late for the youngster to make much of an impact but he did mange to get in the right position for a late chance. Theo was the creator again as he put on the after burners to chase a ball played out in a counter attack, the Swedes were stretched at this point and as Theo worked his way into the box he saw Oxlade-Chamberlain at the far post. The ball was played over and heading to the boot of young Alex only for an over enthusiastic Steven Gerrard to charge into the box and steal the ball before it could reach the Arsenal man. The connection from Gerrard sent the ball flying into row Z and the chance was gone. England still managed to hold on to record the 3-2 win and move a step closer to qualifying from their group. Roy Hodgson’s tactics were working in the first half, they got thrown upside down with the sloppy Sweden goals early in the second half however he had a plan B in the two Arsenal players on the bench and thankfully he saw that early enough to introduce Theo who made the all important difference. So as England get ready for their second match day of the group against Sweden news filtered through that Roy Hodgson has decided to go with two strikers up top at the expense of Alex Oxlade-Chamberlain. Many gooners may be upset with this news but I don’t see it as a major issue. As we saw in the first game against France the England unit went into the match with a game plan to nullify France’s attack and nick something on the break. Many saw this as negative tactics but at the end of the day the draw achieved was a great result against one of the stronger teams in the tournament. Now Roy Hodgson has come in for a lot of stick for his squad selections and obvious excitement killing approach. I myself have not been overly optimistic of England’s chances going into the Euros however after examining the France match and hearing the plans for today’s match with Sweden I realise Hodgson’s tactical nous for these types of games. Many people lamented the appointment of Hodgson over Harry Redknapp. The nation seemed to have their heart set on the now ousted spurs manager. Though when you think about it given England’s loss of many important players England really need to get their tactics spot on to advance in this competition.Roy Hodgson can draw on his experiences of managing around the world to instil into the England team some tactical savvy. Big European tournaments like this need tactics to be spot on and I’m sorry but Harry Redknapp who has proved over the last season he lacks heavily in that department. If he was the England manager he would have just picked his fastest players and told them to play like how they do for their club team. That would have been a suicide mission against the French. The gaps that Hodgson ensured were filled by the likes of Milner, Gerrard, Parker and Oxlade-Chamberlain would have been exploited and would have left to an open game in which we may have scored a few but also would have conceded and probably lost. We may have experienced an amazing game but that is irrelevant if we lose the game. There’s no point gaining plaudits for entertaining attacking football spectacles if we are on the first plane home. Much like how Tottenham played the season with their swashbuckling style which worked at the early part of the season, once the season moved to the business end and required a change and more clever approach to games; Harry just kept on trying to play the same style with the same players and ended up burning out his important players. That is probably what opened the FA’s eyes as to what the Tottenham man was lacking and did not want an embarrassment on their hands at Euro 2012. Anyway I feel Oxlade-Chamberlain not starting today is not based on him not performing against France or Roy Hodgson not believing in the player. I believe the England manager has adjusted his tactics to ensure his game plan for today’s game is spot on. It was a nice surprise when Alex started against France there cannot be a bigger compliment that the manager believes in you if he starts you as an 18 yr old against a big team like the French. Today’s game Hodgson recognizes the need for a second striker against Sweden; he will utilize Ashley young’s experience on the left after assessing the Swedes weaknesses in the game against Ukraine. Oxlade will gain a lot from the experiences for England and developing the non attacking side of his game, this is equally as important as beating 3 men on the wing. Arsene Wenger did a similar thing when bringing Jack Wilshere into the team; he played Jack in a more withdrawn defensive role in the Arsenal midfield and allowed him to develop that side of his game. Jack developed into an a more all round midfielder because of this and his contribution was invaluable to the Arsenal team. Defensive awareness and contribution may be unglamorous especially when you can see what a player can do offensively but it is an important attribute needed in today’s game. It’s when a player learns when to utilize both skills sets that he becomes a valuable cog in the team. Expect England to be more offensive against the Swedes though still cautious of what is at stake. I actually feel Walcott will more likely be used in this game than Oxlade-Chamberlain as his pace can stretch the Swedish defence if the Swedes are still chasing a result in the second half. Young Theo is almost becoming the forgotten man after all the headlines focused on Alex making his first start against France. However I feel Theo still has a part to play in this competition we will see him involved more in the next two games. Niklas Bendtner has drawn attention to himself for all the wrong reasons after his two goal performance against Portugal. After heading in the second goal against the Portuguese he shamelessly decided to lift his shirt; revealing his underwear which was conveniently positioned higher than his shorts. The shorts had Paddy Power emblazoned across the fabric and now UEFA and the Danish F.A are pulling him up for plugging the Irish betting company with his stunt. Bendtner denies the claim and states it wasn’t pre-planned, he also states they are lucky pants which he wore in the previous game (hope he washed them). Very silly move from the Dane and I hope any impending fine is covered by the fee Paddy Power probably paid him to reveal himself in such a way. Many other players probably have planned the same thing. I’m sure Cristiano Ronaldo has a massive Giorgio Armani logo on his man knickers ready to expose to the world, problem is he has been pants and can’t score to save his life at this tournament so far.